Latex free tubing on stethoscope matches latex free BP bladder. Stethoscope is complete with all accessories. BP has nylon/velcro calibrated cuff. Both fit neatly into an oversize zip color matched case. When ordering this item just specify your color choice BLUE, BLACK, DARK GREEN, PINK or PURPLE in the COMMENTS section on your order. If no color is specified we will choose for you. 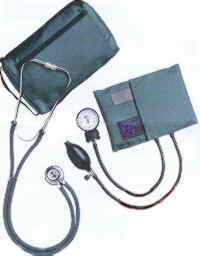 #2: single-head stethoscope together with a nice little sphygmomanometer in a home blood-pressure kit, they come together in a soft imitation-leather zipper case. 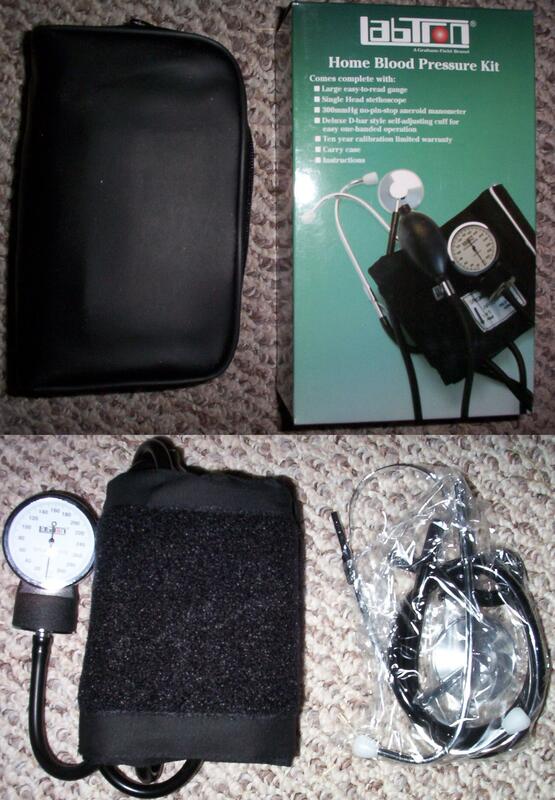 5 dollars less, but THIS one IS made with latex, but only the sphygmomanometer (the bladder inside the cuff - who cares - and I think the squeeze bulb), not the stethoscope. Made by Lumiscope as well, or at least Labtron which is evidently part of Lumiscope.